Old Oakland History and parties...two of my favorite things. Oakland Events is coordinating a Birthday Beer Bash Block Partay! Say that really fast 10 times! 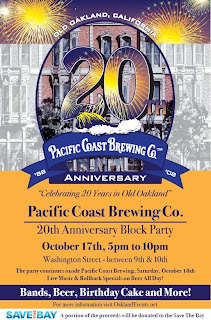 Pacific Coast Brewing Company is Celebrating 20 Years in my Beloved Old Oakland. There will be live bands, a special edition beer, appetizer specials and of course Birthday Cake! I'll be hanging with a fine bunch of Yelpers aka the EB DYL Crew. Admission is free to the block party. They're charging for food & drink, duh.